I'm not sure if I've seen this before, but thanks to www.seekingmichigan.org it's online for all to see. There are some interesting things on this document. First, his name is listed as Harry Houdini, not his real name Ehrich Weiss. Next, his profession is listed as 'ACTOR & LECTURER', not magician. His date of birth is April 6th, 1874 and his birthplace is Appleton Wisconsin. I'm going to have to go back into my records and see, but I wonder, did Houdini know of his real birthplace and date. I probably knew this and just don't remember. Finally, Cause of Death are all the various things we have heard in the past: Diffuse Peritonitis, Streptococcic, Ruptured Appendix. 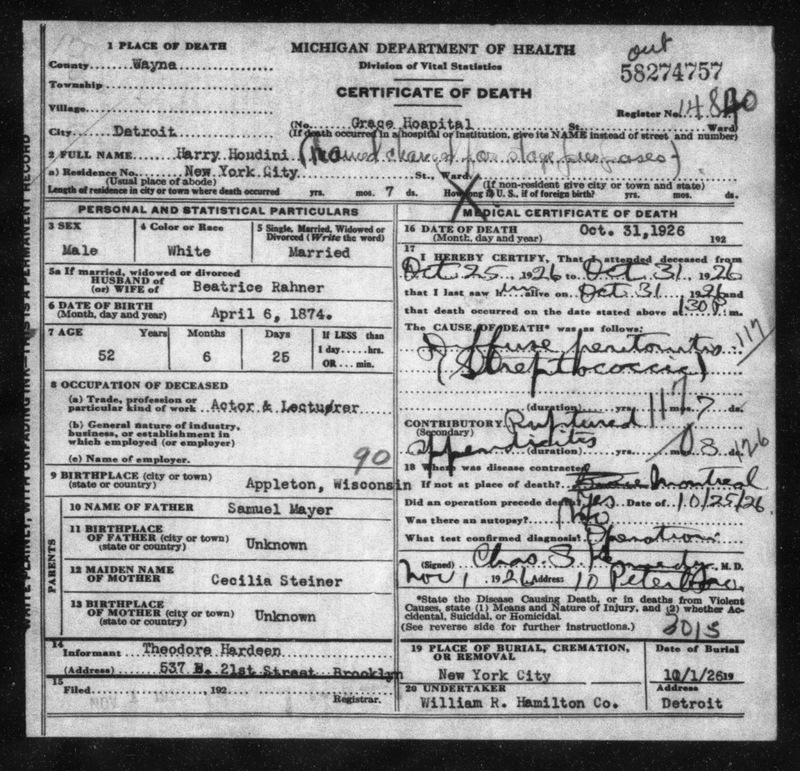 I never even imagine that I will get a death certificate in the 1874 years and here it is with the help of Wisconsin death certificates as they have collected all of those certificates.